A small addition to my original cookie recipe makes a big impact. 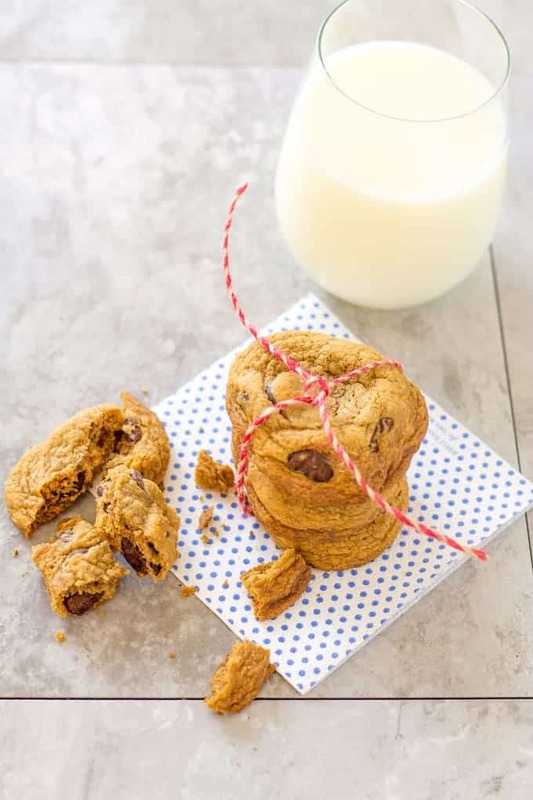 These cinnamon chocolate chip cookies are a spicy twist on a classic! I can never get enough cookies and neither can my kids. They love when I make cookie dough because I make 3 or 4 batches at a time. I do this because I hate washing my mixer so I make a few recipes at one time, store them in the fridge, and I only have to clean up once. 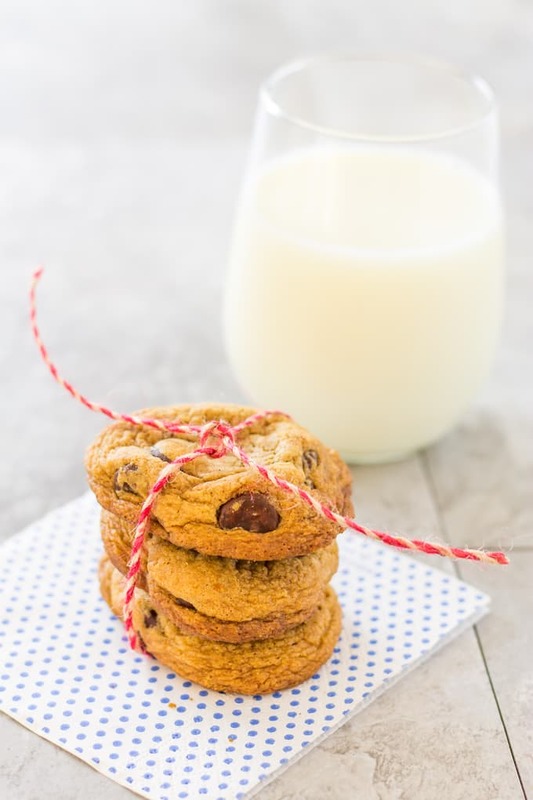 I haven’t made cookies since we moved this summer so when I made these Cinnamon Chocolate Chip Cookies last week the kids were super excited. It means there is cookie dough to be eaten!! Cue the walking by and grabbing a square and eating it right cold and right out of the fridge. This post may contain affiliate links. I may earn a small commission for my endorsement, recommendation, testimonial, and/or link to any products or services from this website. 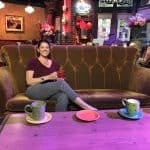 Your purchase helps support this blog, at no additional cost to you and allows me to continue to bring you delicious recipes. 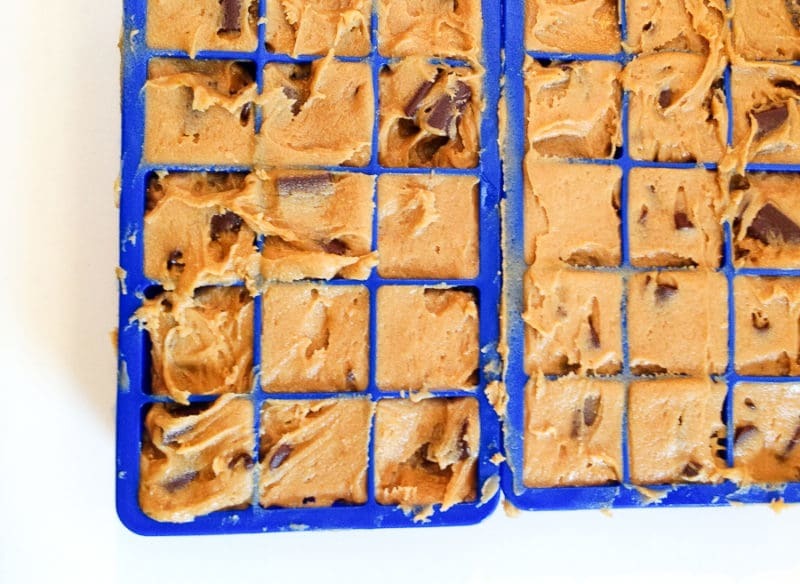 When I make cookies I store the dough in silicon ice cube trays. You might be thinking why do I do that? The reason is that when I make cookies, I use my original dough base to start. After years of getting it wrong and finally getting the dough exactly how I like it, I have to make sacrifices. One is that I don’t bake my cookies right after I make the dough. This bums my kids out because it means they have to wait but they know the wait is worth it. See, the base dough is made with melted butter which equates to a loose or runny dough when it is all mixed. I can’t bake the cookies at this point or they will all turn into flat pancakes because they spread when they cook. The cookie dough needs time to rest and firm up a bit which means a long nap in the fridge. Have you ever tried to scoop out a 1-inch ball of cold hard dough out of a large batch? Many spoons have given their lives to this scenario. To avoid this I pour my loose dough into silicon ice cube trays right after I mix it. I wrap the trays in plastic wrap and then store in the fridge. The next day I can pop out a square of dough and pop it in the oven. I can bake 1 cookie or a whole batch, it is up to me! This also makes it easy for the kids to grab a square or two of the fridge and eat it on the run. I can also pop them all out and store the dough squares in the freezer for a few months and wash my ice cube trays for something else. If you are planning on using this technique, please make sure you spray the ice cube trays with non-stick spray. From all angles!! If you don’t the dough will not pop out in a nice square and you will be digging it out with your fingers. Another upside of this is: the cookies are all the same size. This means they will all cook evenly! Cookie making, portioning, and eating made easy. 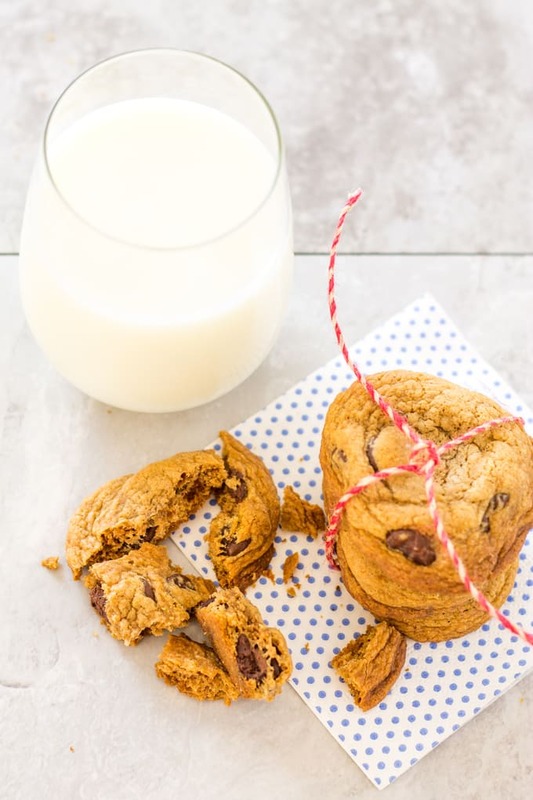 These cinnamon chocolate chip cookies are another version of my classic chocolate chip cookies like my White Chocolate Macadamia Nut and Dark Chocolate Toasted Coconut cookies. I even make them into “fries” with dipping sauces. What are you favorite cookie variations? In a stand mixer, fitted with the paddle attachment (hand mixer is okay but mine struggles toward the end), add butter and sugar. Mix together until they form a loose paste. Add egg, egg yolk, milk, and vanilla. In another bowl, mix together the dry ingredients minus the chips. Add the dry ingredients to the butter and sugar bowl and stir until incorporated. Do not over-mix or the cookies will be tough. Add the chips and mix just until they are spread evenly throughout. Sometimes I do this step by hand. The dough will be runny at this point because of the melted butter. If you were to bake these now they will turn into flat, crunchy cookies, so I chill the dough overnight*. When ready to prepare, portion into 1 1/2 inch balls and bake on preheated, parchment lined baking sheet for 11 minutes or until edges start to brown. Pull the cookies out of the oven and let them remain on the sheet for another 10 minutes. Remove to cooling rack until ready to eat or store in an airtight container. The cookies will keep at room temperature for 4 days. The dough will keep in the refrigerator for 1 month or in the freezer for 3 months. 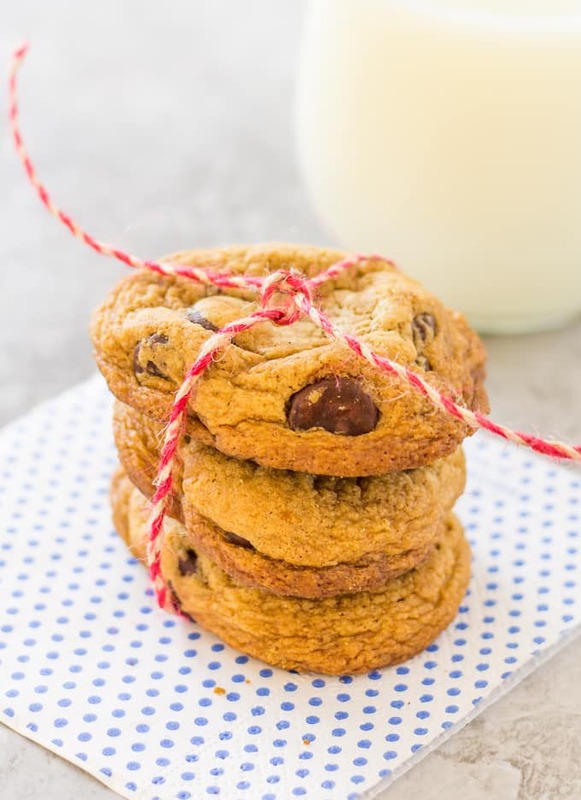 We shared this cinnamon chocolate chip cookies this holiday season. Everyone in the family loves it! Every bite burst with happiness, it’s like the heaven opened its gates. This is so good, so thumbs up! Thank you so much! I am so glad that you like them! I am loving this cookie recipe. I will be making it again this New Year’s Eve Party celebration. My kids love it and they won’t stop eating. Thanks for this. Merry Christmas and Happy New Year! Thank you so much for putting this recipe together.